Short answer: about $20,000 for the first year. I just did the math on how much greater our expenses were in 2014 than we would have expected if we had not had a baby in March. I did it based on the calendar year because many of the expenses (medical visits, pre-birth purchases) started before the birth. Childcare: We only used a couple of weeks of daycare at $350/week. We’ve since switched to a system in which Jeff works full time and I work part time, and Lily is never in daycare. Our social life consists mostly of things we can bring her to, so we haven’t really needed babysitters at night. Clothes: we got a lot of hand-me-downs, and aside from that bought clothes from thrift stores or the local children’s resale shop, where they cost about $4/item. I inflated our number in case you needed to buy everything. Gear: includes bottlefeeding stuff, cloth diapers, toys, a crib, a rug, a couple of carriers, and a series of glider chairs. Includes $100 for extra loads of laundry done. We got a carseat as a hand-me-down, but I added $100 to the tally in case you needed to get one. Breast pumps are now covered by insurance in the US, but bottles and other parts are not. Medical/hygiene: copays and miscellaneous purchases at the drug store. We paid more for better medical insurance this year, plus more copays for more medical visits. Most of our insurance premiums are covered by Jeff’s work, so if he worked for a less generous company we would have paid more. Lost wages: I got no paid matenity leave from my job, though I did save up about two weeks of vacation days. I quit my job for five months, then went back part-time. Jeff used 8 weeks of paid parental leave to care for Lily while I was working. My schedule currently dovetails with Jeff’s: he works full-time starting at around 7 am, and I work evenings and Saturday mornings. If we had less flexible work schedules, or if he had not gotten the two months of paid leave, our costs would be higher. Housing is conspicuously absent on this chart. We did not change our housing this year, though we did start the process of buying a house. Lily slept in our bedroom. This got hairy at times, and we’re looking forward to having a separate room for her. The delay in moving was more about looking for the right house than about trying to save money. Food for a breastfed baby costs virtually nothing. Edit: I forgot that I eat an extra 500 calories daily while pregnant or breastfeeding. This cost about $500 extra in groceries. Lily’s also eating some solids now, but she mostly eats yogurt and bits of what we’re eating. We did not pay more for transportation because we did not buy a car. Living with family and being able to use their car sometimes was helpful. Not included: tax breaks. We expect around $350 in the child tax credit (maximum is $1000 if you earn less than we do). We also expect lower taxes in general because of having a dependent. We don’t know how much this will end up saving us; I’ll update after we do our taxes. Also not included: costs to our careers. Jeff taking the full paternity leave provided by his work probably hurt his job slightly, though not like it would in a more cut-throat business. Taking time off delayed me getting the hours of supervised work I need for the final step of social work licensure, which is essentially a ticket to better jobs. The federal government’s “cost to raise a child” calculator thinks we (as a two-parent high-income family in the Northeast) would spend about $30,000 during our child’s first year, not including lost income, which I count as an expense. So we came in well below average. If we had been scrimping, we could have spent less, especially by using paid childcare for more of the time. Things that could make it more expensive for other families: moving to larger housing; buying a car or better car; formula-feeding (would cost around $1200/year); less flexible work schedules that would necessitate more child care from other people; less of health insurance covered by work; no paid paternity leave; higher initial earnings resulting in more earnings lost from unpaid leave; living in a more expensive area; using disposable diapers, living in a country with free healthcare. Things that could make it less expensive for other families: generally scrimping more; more free care from relatives; receiving food assistance, daycare vouchers, or other benefits; lower income and thus more child tax credit; living in a cheaper area; using daycare more, allowing both parents to work full time; living in any of the 163 countries that provide paid maternity leave. 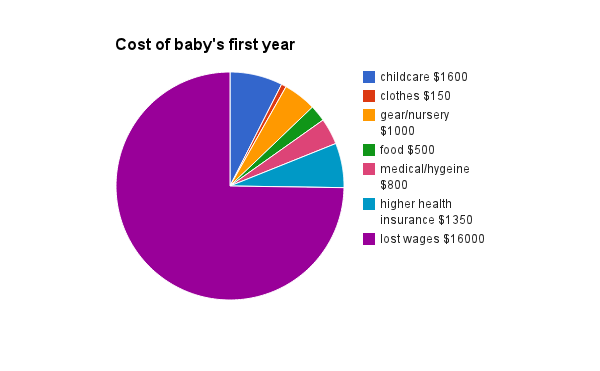 Part two: thoughts on the non-financial pros and cons of having a baby. This entry was posted in Uncategorized and tagged children, I love pie charts, money on December 23, 2014 by Julia. Was this at CEA? Being from Canada/the UK, this seems completely barbaric. CEA has a much better policy, which I helped write!